Many people wonder why a doctor would order a MRI over a CT or Xray. In most cases, the reason lies in the differences of information each test or exam can provide and/or the manner it which the test procedure is done. How MRIs are very different than X-Rays. The biggest difference between an MRI and X-ray is in the manner in which the image is produced. There are no ionizing radiation (the fancy term for X-rays) involved in producing an MRI scan. Instead, MRIs use a strong magnetic field and pulses of radio waves to make images of structures inside the body. So in the broadest or biggest sense, an MRI scan prevents a person from any exposure to X-Rays or any other forms of radiation. However, that causes another big difference between them both. An MRI may take anywhere from 30 to 60 minutes or more to capture the images. Sometimes even a couple hours in certain circumstances. An X-Ray, however, is somewhat instant compared. Most xrays take around the same time as snapping a picture with your phone or camera. So you could see why in cases such as an emergency, an xray might make more sense. If a doctor is looking for the most complete information he can get from a test, there is one clear winner - an MRI. Not only can an MRI provide pictures from almost every angle, it can provide a 360 degree view. And, if finding out about a patient's blood vessels are part of the equation, the addition of a contrast given during an MRI can show blood flow and other blood vessel data that no other test can provide, including an xray. MRIs are very good at identifying legament tears and joint effusions in knee of shoulder injuries. They are also preferred often in the imaging of the spine since both the bones and the spinal cord itself can be evaluated.An MRI can also frequently detect a bone bruise when no crack is visible or hard to see on an X-ray. 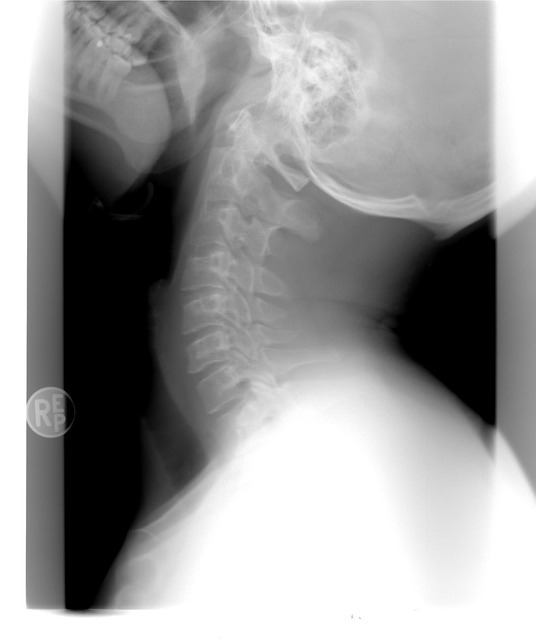 ABOVE: XRAY of Cervical Spine and Neck. How MRIs are very different than CT scans. MRIs and CTs are similar in a lot of ways. Both can take about the same amount of prep and time. This link provides a much more detailed list. But in short, these differences stand out the most. 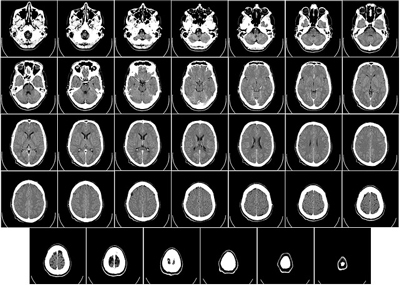 MRI scans are produced in such a way that it is possible to take pictures from almost every angle, whereas a CT scan only shows pictures horizontally. MRI scans give you a more 360 degree view where CT scans are more like very thin slices of bread. In this analogy, think of viewing CT like a loaf of bread if you had one end in front of you and you flipped back the slices one by one, never moving the loaf. Whereas with a MRI, you could hold it up, turn it any way you want, seeing inside of it any way you want. So when it comes to detail, MRIs usually win especially between details such as normal and abnormal tissues. Like an X-ray, CT scans also use ionizing radiation to produce images. MRIs do not. Basically they use strong magnetic fields and pulses of radio waves. So no radiation with a MRI. However, if any metallic devices or hardware are present in a patient from a past surgury or from other sources, a CT may nned to be ordered in place of an MRI. ABOVE: CT of head taken as slices. ABOVE: MRI of head in dynamic view.